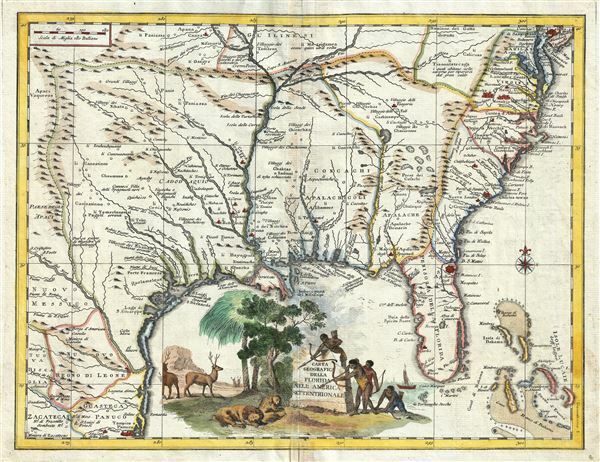 A rare decorative map of the southeastern United States in the colonial period. Carta Geografica Della Florida Nell' America Settentrionale. This scarce map by Giambattista Albrizzi is a curious and somewhat retrogressive 1740 Italian variant on Delisle's 1718 map of Texas, Louisiana, Florida, and the southeastern British coastal colonies. Roughly following the topical model as laid down by Ortelius in 1584, this map is centered on the Mississippi River and covers from the Rocky Mountains to the Atlantic and from the latitude of Philadelphia to Panuco (Mexico) and the Bahamas. Throughout the map cities and fortifications are rendered pictorially in the early 18th century European fashion. In particular, St. Augustine is presented as a mighty fortification. Other cities so rendered include Philadelphia, Charleston, Panuco, and (curiously) several Mohawk villages in Virginia. Smaller towns and American Indian villages are presented as churches. The political divisions presented here are also of exceptional interest. The cartographer limits the British colonies to a narrow band of land to the east of the Appalachian Mountains. Georgia is identified within the limits of South Carolina and North Carolina is 'Virginia Vecchi' (Old Virginia). Virginia itself hosts two large Mohawk villages within its Various European towns in Virginia, including Jamestown, are clearly intended to be overshadowed by their Amerindian neighbors. To the west of the Appalachian Mountains and bounded by the Apalachicola River, is the territory of Apalache. West of the Apalachicola River as far as the Mississippi, Albrazzi identifies Concachi or Apalachicoli. Beyond the Mississippi, a vast region abstractly following the boundaries of the original Texas charter is identified as Cadodaquio, referencing an American Indian tribe known among the French as the Quadodaquious and among the Spanish as Kadohadachos. The name 'Texas' or even 'Tejas' does not appears - a curious omission given that the 1718 Delisle map upon which this is loosely based is in fact the first published map to name Texas. Albrizzi's incorporation of a large decorative cartouche at bottom center is of special note. The graphic, which includes lions and deer (despite the fact that lions are not indigenous to the Americas), as well as stylized American Indian hunters, was most likely drawn by the well-known Italian artist Giovanni Battista Piazetta (c. 1682 - 1754). The incorporation of Piazetta's graphic elements, which innovate by being more descriptive that allegorical, was an important advancement for 18th century Italian school cartography and set the stage for the later cartographic publications of Antonio Zatta, among others. This map was drawn and prepared for issued in G. Albrizzi's 1740 Atlante Novissimo che Contiene Tutte le Parti del Mondo. The work is essentially a decorative Italian reissue of Isaak Tirion's 1730 reissue of G. Delisle's c. 1700 atlas. Giambattista Albrizzi (1698 - 1777), a.k.a. Giovanni Battista Albrizzi, was an Italian publisher and journalist active in Venice during the mid-18th century. Albrizzi was the scion of a well-established Venetian publishing dynasty and followed in the footsteps of his father, Girolamo Albrizzi, who founded the family printing business and is known for publishing the work the great Venetian cartography Vincenzo Coronelli. Giambattista Albrizzi is generally considered to be the most prominent 18th century Venetian publisher. Today he is best known for his friendship and collaboration with Giovanni Battista Piazzeta (1683 - 1754), a well know Venetian artist and engraver, whose drawings and engravings appear in many of Albrizzi's publications, including his maps. Giambattista Albrizzi's cartographic work, while not particularly innovative in terms of content, often featured elaborate decorative elements designed by Piazzeta. Through the integration of such decorative elements, Albrizzi hopped to revive the reputation of Venetian publishing, which since the late 17th century, had fallen in regard since the days of Girolamo. His work helped lay the foundations for Italian school decorative cartography in the late 18th and early 19th century, including the work of Antonio Zatta, among others. In addition to Albrizzi's work as a map and book publisher, he also issued a weekly journal, Novelle della Repubblica delle Lettere, a kind of early newspaper that played an important role in Venetian business and intellectual life. Albrizzi, G. B., Atlante Novissimo che Contiene Tutte le Parti del Mondo, (Venice: Albrizzi) 1740. Very good. Original Platemark visible. Wide clean margins. Blank on verso.